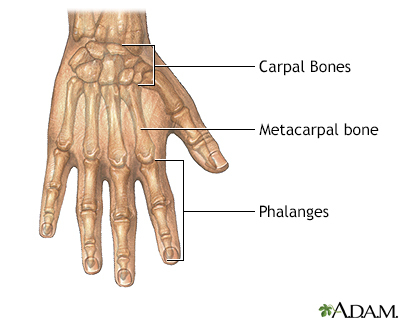 The hand develops normally in the vast majority of people, resulting in five normally functioning digits. 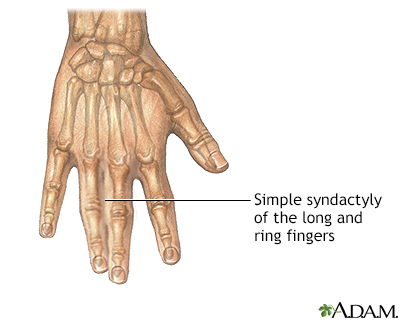 Syndactyly is the abnormal development of the hand, such that the fingers are fused. The number of digits fused and whether or not the bones and nails of the fingers are fused is variable. Surgical repair is indicated in cases in which functional ability or cosmetic appearance is impaired. Skin areas to be repaired are marked. The skin is incised, and the fused tissues are separated, including bone if necessary. Small flaps at the sides of the fingers and in the web are lifted up. These flaps are sutured into position, leaving absent areas of skin. These areas are filled in with full thickness skin grafts taken from the groin. The hand is then immobilized with bulky dressings or a cast. The results of the repair are dependent on the degree of fusion of the digits. When joined fingers share a single fingernail, the creation of two normal-looking nails is rarely possible. One nail will look more normal than the other. 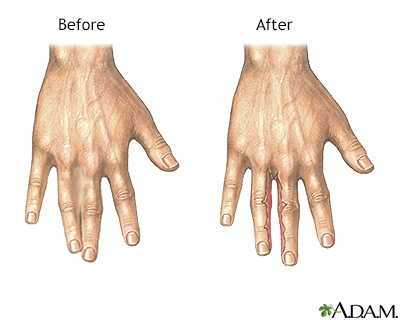 Some children require a second surgery, depending on the complexity of the syndactyly. Hospital stays of one or two days are common. Small children with hand syndactylies may have a cast put on that extends above the flexed elbow. Sometimes, the cast extends beyond the fingers or toes. This protects the repaired areas from trauma.